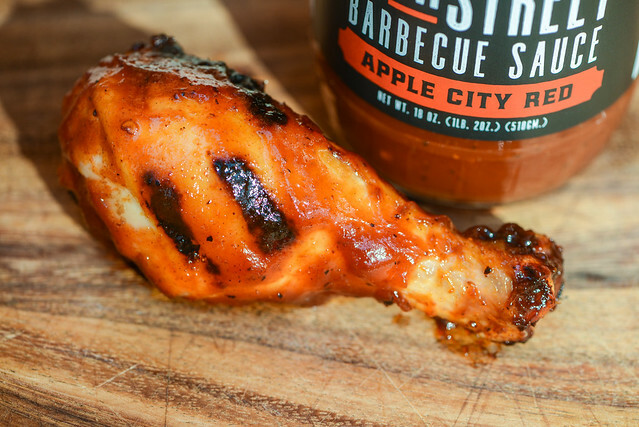 A truly excellent balance of bright and sweet tomato with tangy vinegar and a complex, yet harmonious mix of spices that worked both on and off the grill, makes Apple City Red a go-to choice for just about any application. My first press trip in my early years of blogging was to the Best in the West Nugget Rib Cook Off in Reno by way of an invitation from the father and daughter team of Mike and Amy Mills from 17th Street Barbecue. That event forged a friendship that still persists today, and partly because of that, I've questioned my ability to be unbiased and resisted reviewing their sauces. I got the word recently though that they reformulated their recipes to use non-GMO ingredients and brought production in-house, so what's in the bottle is exactly what they want it to be. So I took them up on an offer to try out all four varieties from this Southern Illinois institution, whose home base is located in Murphysboro. For those not familiar with the Mills family, Mike is simply known as "The Legend" thanks to his long running streak of winnings under the team name Apple City Barbecue, as well as a record for being touted as having some the best barbecue across multiple publications over the years. Amy continues the barbecue family business and also runs her own barbecue consulting business called On Cue. They both also are co-authors of two cookbooks and host a barbecue competition in their hometown of Murphysboro dubbed Praise the Lard. A tangy and spicy tomato aroma greets you on first whiff of this sauce. The smell is straightforward and not overly complex with its bright, acidic tomato base that has some sweetness behind the more dominant vinegar. There's also a definite peppery heat in there that has a layered smell, with slight smoky and earthy notes to go along with the spice. This glossy, smooth sauce has a rusty red hue and is semi-opaque. This makes it easy to see the tons of spices that come in black, red, and white specs in various sizes. 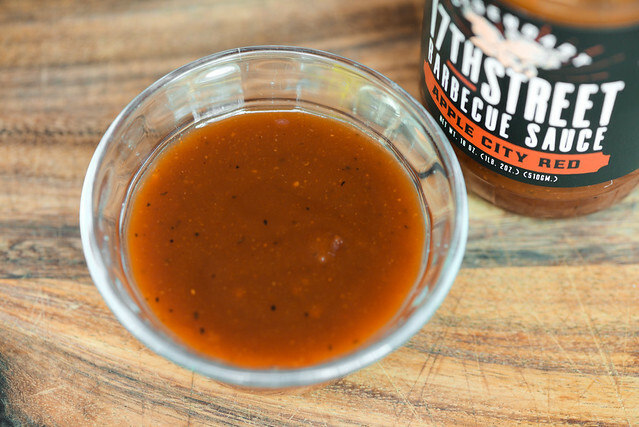 The sauce's consistancy is medium-thin and it falls in a quick, continuous, and syrupy pour from a suspended spoon. Once most of the sauce has fallen, a couple final drops release, and a medium coating of sauce is left clinging to the silverware. An initial bright and sweet tomato taste quickly gains balance by a strong kick of vinegar. While that turns the flavor profile incredibly tangy, there's enough lingering sweetness to provide a good balance. As the sauce settles on the tongue, the background players start to make themselves known. Most notably, there's a faint onion-y flavor that mixes with and earthy pepper. Then, as the sauce leaves the tongue, the vinegar tartness is turned up a few notches while the heat works it way in, leaving a final tangy and spicy aftertaste that retains some remnants of its sweet and fruity tomato beginnings. The sauce coated the chicken in a thin, even layer that baked down well over indirect heat. When moved directly over the coals, the sauce saw some light caramelization and just a little burn off, but mostly held up really well. That initial bright tomato flavor persisted and became more dominant after being cooked. It struck an even better balance with the vinegar, which was in some retreat. This led to the spices also playing a stronger of a role, adding more complexity than was tasted in its raw state. While there was a lot of great flavors going on with the sauce, they were not so bold that they overpowered the chicken, allowing for the flavor of the meat to still come through. I really liked this sauce. I liked it so much that I immediately slapped it with a 9 (my highest score to date) and had no qualms about it. Then, a couple days later, I wondered if my relationship with the Mills was coming into play here, but after some time between my initial test and writing the review—when I cracked open the sauce again for a second try—all the flavors that filled my first impressions came rushing back and I can confidently say that this is really great stuff. Out of the jar, the bright tomato, intense tang, and multi-layered spice all worked harmoniously and would be excellent on pork, wings, burgers, or even a dip fries or other goodies. When cooked, I feel like the flavor just improved with a more equal sweet and tangy balance along with more pronounced spices, creating a complexity that provided very full flavor, but didn't mask the natural flavor of the meat. 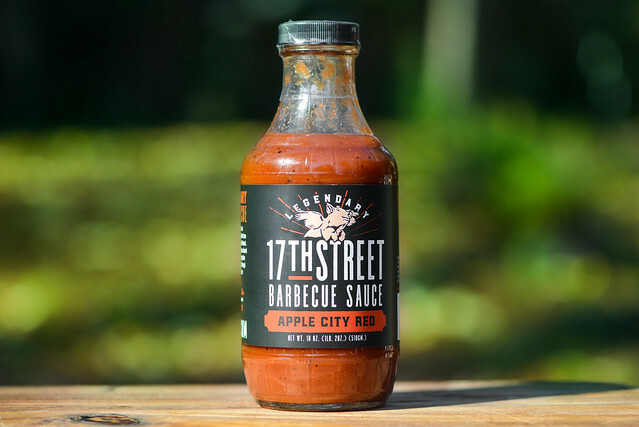 This, in my mind, makes Apple City Red a perfect go-to, all-purpose sauce, ready to be used on and off the grill on just about anything—I can't imagine this sauce not delivering the goods in any scenario.